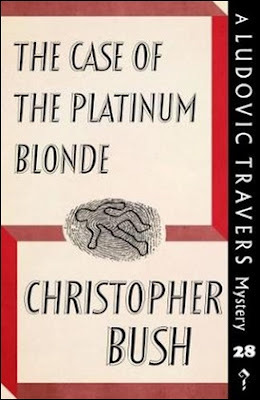 The Case of the Platinum Blonde (1944) is the twenty-eighth entry in the Ludovic Travers series and one of Christopher Bush's wartime detective novels, of which The Case of the Murdered Major (1941), The Case of the Kidnapped Colonel (1942) and The Case of the Fighting Soldier (1942) are the high spots, but Bush released his series-character from the army in 1943 – freeing him to look into crimes committed among the civilian population. And in these novels, the war only takes place in the background of the stories with references to blackouts, the Blitz, rationing and War Savings. The Case of the Platinum Blonde is a traditional and quintessential British village mystery rife with blackmail, deceit and murder, but distinguished itself by the burden of a moral dilemma faced by Travers. A burden he shares with the reader in the final chapter. Major Travers is out of the army and is going to spend a fortnight in Cleavesham, Sussex, to visit his sister, Helen Thornley, who has taken a small cottage in the village, while her husband is fighting in the Middle East, but before taking his leaves he drops by his old friend, Superintendent George Wharton – who has a chore for him. Wharton has a cast-iron memory for faces and collects them like one collects stamps or coins. Two years ago, Wharton saw an elderly, limping man with a grizzled beard in Cleavesham and knew he had seen him before, but can't remember where or when. And it bugs him to no end. Travers promises Wharton he'll poke around the village to see what he can turn up. Well, it doesn't take Travers very long to identify the bearded, limping man as one Herbert Maddon. A "quite superior old man" who moved to the village nine years ago and lives at Five Oaks, but when he visited the cottage he saw a man nailing a sign to the backdoor with an ominous warning on it. The sign warned Maddon that "THE DAY OF VENGEANCE IS AT HAND" and "THIS NIGHT SHALL THY SOUL BE REQUIRED OF THEE." A final warning was printed below it, "ABSOLUTELY FINAL WARNING," with a deadline: "TO-NIGHT, 11.00 P.M., SAME PLACE." Curious, nosy as ever, Travers decides to make his acquaintance with this peculiar character, Augustus Porle, who impressed him as "either a crank or a lunatic" with a strong believe in the "prophetic qualities inherent in the Great Pyramid," but wisely kept quiet about what he witnessed at Maddon's cottage – something he tends to do throughout the story. On the following morning, Travers discovers Maddon's body in his cottage with a bullet in his head. This is the point where a (sort of) two-tier investigation begins: one is the official police investigation and the second one conducted by Travers, which is more of a private inquiry and presents him with the previously mentioned moral dilemma. And this why he plays his cards close to his chest. Even waits with giving the (local) police vital information. Such as seeing the village warden, Bernard Temple, entering the cottage after he discovered the murder and taking money from the Maddon's wallet before kicking the dead man in the ribs – preferring to rectify this matter himself. So this alone makes the book an interesting variation on the village mystery, but the story gets really good when Wharton reenters the picture. I commented in past reviews how much I enjoy it when Travers and Wharton work together, because they play off each other so well. Wharton calls Travers "the world's prize theorist" and has been profiting from his theories ever since their friendship began, but Travers admits his "average is one theory right in every three." And when Wharton has a theory, it isn't "an airy flashing thing," but usually "the genuine article." So on more than one occasion, such as in the wartime trilogy, Wharton was able to beat Travers to the solution and this adds another layer of enjoyment to these books. Travers and Wharton have genuine respect for one another, but don't always see eye to eye on their respective methods, such as Travers' predilection for secrecy or Wharton's handling of suspects, which are both on display in The Case of the Platinum Blonde. In my opinion, Bush nailed the relationship between the professional and amateur detective in a way like no other mystery writer from his time did. But let's get back to the story. Wharton is friends with the Chief Constable, Major Chavelle, who's wife, Thora, emerges as a serious suspect based on such clues as hairs, lip-sticked cigarette-ends and the lingering smell of her perfume in Maddon's cottage. Even more damning, Wharton demolished her clumsily contrives alibi, but did she really pull the trigger? And why? This question makes up a big part of the plot along with the side-plots like where Wharton had seen Maddon before. And who he really is. Why Porle nailed that sign to the door and why he disappeared after the murder and a multi-faceted blackmail plot that appeared to have engulfed the entire village of Cleavesham. So this makes the book one of Bush's more twisted detective stories in the literal sense of the word. A second murder is committed quite late in the book and this one gives Bush an opportunity to wheel out one of his trademark alibi-tricks, one as clever as it's risky and probably hard to actually pull off, but watching Bush tinker with one of these tricks is as satisfying as a well put together locked room illusion – as well as providing the plot with a partial false solution. Travers tells the full story to the murderer and reader in the last chapter. How much you'll end up enjoying the book, as a whole, depends on your moral compass. I suspect many readers today would probably frown upon how Travers handled this case and his moral dilemma. Kate of Cross Examining Crime reviewed The Case of the Platinum Blonde in 2017 and my impression is that she wanted to slap the horn-rimmed glasses off his face, while giving him a lecture about morals, ethics and the law. I, on the other hand, always ask myself one question when confronted with this kind of quandary in a detective story: what would Dr. Gideon Fell or Sir Henry Merrivale do in this kind of situation? ;) So, yeah, my response was only slight annoyance that Travers couldn't make up his mind. I would have been fine either way the chips had fallen down, because, while the murderer deserved some sympathy, there was one part of the plan that's hard to excuse. And deserved some kind of repercussions. 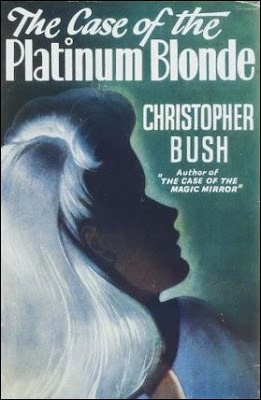 On a whole, The Case of the Platinum Blonde is another great detective novel by Bush, full of twists, turns and clues, which gives the reader an opportunity to reach the same conclusion as Travers by the end of the story, but the ending might rub some readers the wrong way. Anyway, I'll probably do another trio of reviews, back-to-back, next month, because I'm sure Dean Street Press will be releasing the fourth batch of reprints before the end of the year. Thanks for the mention, though I have pretty much forgotten everything about this book! But I'll take your word that I got decidedly irked. It sounds like me to be honest! You're welcome, Kate. And perhaps you should re-read your own review to refresh your memory. You made it abundantly clear you disagreed and were irked by Travers. Anyway, if you ever want to return to Bush, you'll probably find The Case of the Missing Minutes, dark as it is, interesting. Thanks for the review Tomcat. Question: if I were to read only the premise of a Travers book then start reading that book from the midway point, would I still be able to understand the solution? Sorry to hear Bush is boring you to tears, but Cut Throat is the only book that you can read as two separate, but interlinked, stories. The first part tells of the discovery of the body and how it ended up in the hamper, while the second part demolishes the murderer's ingenious alibi. You can't really do this with any of the other novels, because they're one solid story.